this is a list of current champions, and all that have been. 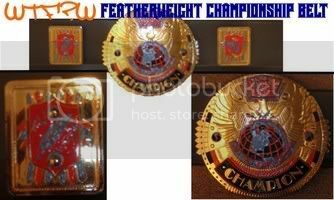 WTFW STREETCORE CHAMPION: This belt is for weapon swinging, bloodletting, ultraviolent wrestlers!!! Sikmayd defeated Fat Stuff, Ol' Evil Eye, and Kyle Cobain an an "I Quit" Deathmatch for the title. Fat Stuff deafeated Mr. Graves after his yearlong reign as champ. Mr. Graves has held the title since Lambdapalooza in May 2006. 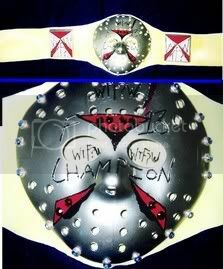 WTFW F-13 CHAMPION:This belt can only be defended on a Friday the 13th, or if the jason voorhees feels like challenging him for the belt, in honor of the debut of our first full show. CURRENT CHAMPION:Jason Voorhees defeated Mr. graves in a "no ring, no rules" match after Chapel had surrendured the title due to traveling complications. 1. Chapel. 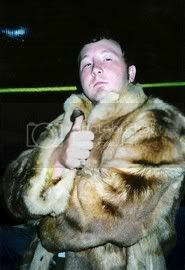 he went through 12 other men in the 13 man X-treme battle royal. WTFW THUMBWRESTLING CHAMPION: These matches are just like pro wrestling matches, but you can't break the hold, and you pin the thumb only. Our current champion is " Dirty, Dirty, Dirty" Scrubbz McGee. He beat "Showtime" Ivan Burden for the belt. All other belts are in the process of being made. So, as soon as they are finished, we will be finding champs to put the belts around. The combatants must be under 200 lbs. to be eligible. There is currently no champion. Men or women can hold this belt. no limitations on this belt.